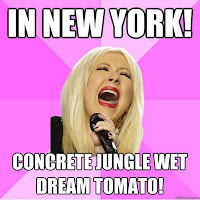 Diva Devotee: Diva dos and don'ts for when you forget the lyrics! 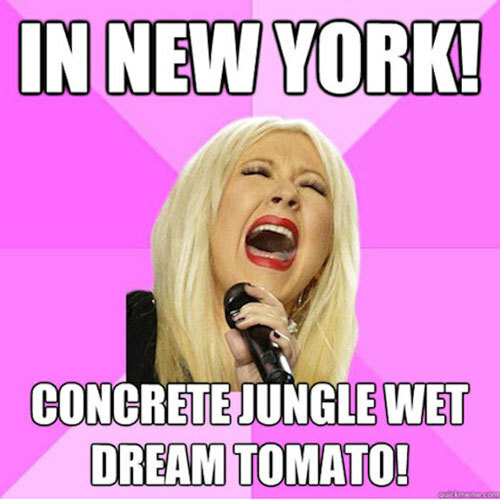 Diva dos and don'ts for when you forget the lyrics! Next to cracking or missing that big note, forgetting the lyrics has got to be every Diva's nightmare. 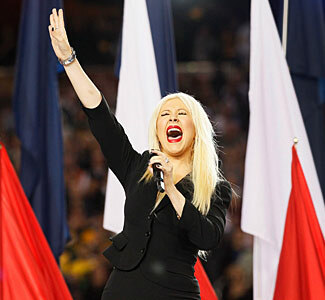 Christina Aguilera will probably be noted as the most famous victim of this feared scenario, having recently experienced it as she sang the American National Anthem to an audience of 111 million- the largest ever for a live broadcast- at the American Super Bowl. It wasn't all bad though, she managed to generate her own meme-see below- out of the experience. A feat surely to rival any awards or accolades she has obtained thus far. Feeling for our singers, we here at DivaDevotee- with many thanks to Devotite Karen who suggested and researched this post- have compiled a list of do's and don'ts to help our Diva's deal with this unfortunate situation if, heaven forbid, it were to happen to them. Do be honest with the audience. Not many singers can do what P!nk does here; forgetting the words and not apologising for it. It's risky move for more, shall we say, polished a Diva, but P!nk has made a career on being less than perfect, so it works for her! Don't make up the words if it's a National Anthem! Poor Christina Aguilera had a bad year: her "comeback" album Bionic flopped, she went through a divorce, and then, just when she thought it couldn't get any worse, the overblown "scandal" of forgetting, and inventing, some of the words of the American National anthem struck at the 2011 Super Bowl. However, kudos to her for carrying on-though to be fair what else could she do- and further congratulations to her for scoring her first number one in ten years last week with Moves Like Jagger in the States. It looks like that Red, White and Blue storm has finally passed. Do write the lyrics in eye line! If perhaps testing out new material, or are just having a fight that day with your frontal lobes, a hand and a pen could be your new best friend! Who needs you brain!! Leona Lewis was spotted successfully using this technique at a recent gig. It worked for her, so it'll work for you! Don't think just because you're Lip sinching you can afford to stop paying attention! If, for whatever reason, you decide that you are going to mime- as the Spice Girls did below- please at least have the decency to make up for this deficiency by being switched on enough to know when you are supposed to be singing! Watch below at 0.21 seconds as Geri Halliwell seems to zone out completely, missing her cue to begin "singing" and then fluffing her lines in the panic. If you are as an accomplished star as Madonna, with a back catalogue as vast as her then some leeway will be given by fans when you forget the lyrics to a song from the vault. Singing Secrets at her Sticky and Sweet tour Madonna turned to the crowd to fill in the blanks when she suffered a memory block with regards to the words. Rightfully so, she admitted to forgetting the words after the song and thanked the audience for their help. Do try to keep your cool. Below is "Asia's Songbird" Regine Velasquez giving a very unique interpretation of Beyonce's Listen. Now, if you were simply following the melody she was singing you'd think she was doing a good job. However, things start to sound horribly wrong when you shift your attention to the words. Clearly forgetting them, Regine Velasquez kept that Karaoke train chugging along by going -hilariously- freestyle with the lyrics. I'm guessing she was hoping the Filipino audience wouldn't notice, but it still demonstrates that you need to keep your cool and stay professional when disaster strikes. Now I am going to seem a heartless so and so with the next example but here goes: if you forget the words to a song, never, EVER start cring. Do anything but that. Do a jig a la Ashley Simpson- who strictly speaking didn't forget the words- or apologise for the fact like Madonna did above, or if worse comes to worse and you can't muddle through- like Regine- walk off the stage and rethink your career choice. Hollie Steel took to the stage as a semi-finalist on Britain's Got Talent 2009 and was clearly so overwhelmed by the moment that she forgot the words and began to sob- note without tears. Initially feeling sad, and anxious for the distressed 10 year old, I thought it would be best for someone- ie her mother- to guide her off stage, away from the lights and cameras, to console and to commend her for having had the courage to try. However, the empathy changed to annoyance when the mother did get up on stage, and instead of consoling, and shielding her, she proceeded to beg like a textbook pushy parent for Hollie to have another attempt. Way to teach your child fairness, and good sportsmanship. Spurred on by her mothers signals, Hollie's "crying" then morphed into a tantrum, that shamefully worked, and was promptly given another pop at the song by Simon Cowell. Who let's be honest really had no choice but to, considering the amount of negative publicity this would generate. And finally DO watch and learn how the vocal legend that is Ella Fitzgerald deals effortlessly with the situation when faced with forgetting the lyrics! Thanks again to regular reader Karen - aka "Shopaholic" - for the idea and the videos! ps - apparently some big stars use autocue - bloody cheats!